Wes Anderson (known for writing, directing, and producing, quirky movies; such as, Bottle Rocket, The Royal Tenenbaums, and The Darjeeling Limited) and Noah Baumbach (writer, director, actor: Life Aquatic with Steve Zissou and the occasional Saturday Night Live) adapted Roald Dahl’s novel Fantastic Mr. Fox into a great, animated interpretation! 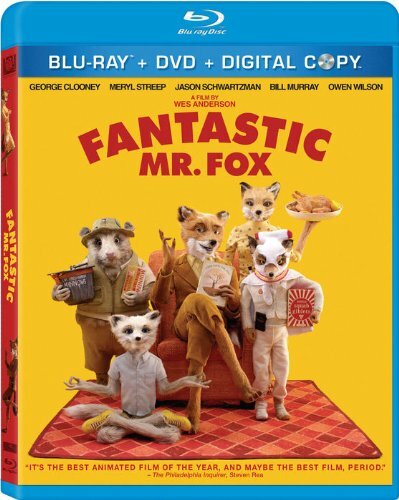 The movie in a nutshell: Three nasty farmers, one ambitious fox and his family, and a community of animals with oddball characteristics. If you’ve read the book there will be parts that strike you as very Dahl—especially when Mr. Fox, voiced by George Clooney, yells, “Dig.”—and others that are wholly Anderson—Mr. Fox’s trade mark whistle-click-click and the continual use of the word “cuss.” The differences between Dahl’s original tale and Anderson’s adaption will certainly make for an interesting book club, classroom, or family reading time discussion—a great opportunity to work on comprehension with a reluctant reader. After all, Roald Dahl’s books are the perfect antidote for getting a non-reader to read. The animation has, on occasion, been described as mechanical and jerky, and, well, at times … it is. But I’m here to tell you that it’s true to the original book illustrations by Quentin Blake, whose infamous style is known for its jarring eccentricity. When you watch the DVD extra about the animation process behind this movie, you’ll only have appreciation for the creativity and cleverness that the animation team collectively possesses. Roald Dahl is well known for his twisted and idiosyncratic characters and Anderson is well known for highlighting unique characters and traits. Anderson and Baumbach took the already well-established characters from the novel and ran away with them—they expanded the depth of each character, added a few extra faces, and allowed the Fox family’s world to flourish. So very enjoyable!